1. Quantity 1: In an examination, Ankita scored 35 marks less than Puneeta. 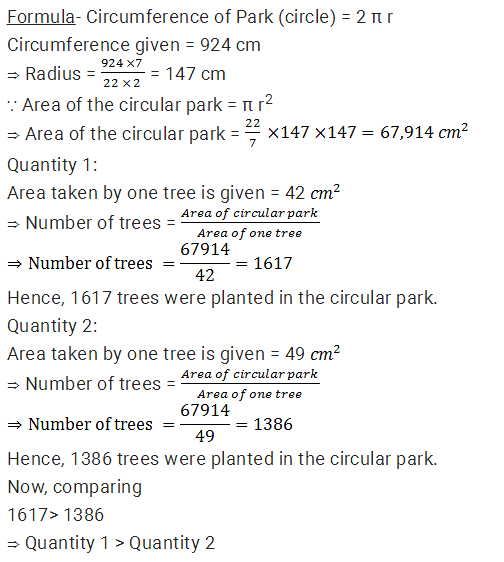 Puneeta scored 65 more marks than Meenakshi. Rakhi scored 115 marks, which is 20 marks more than Meenakshi's. Simpy scored 108 marks less than the maximum marks of the test. 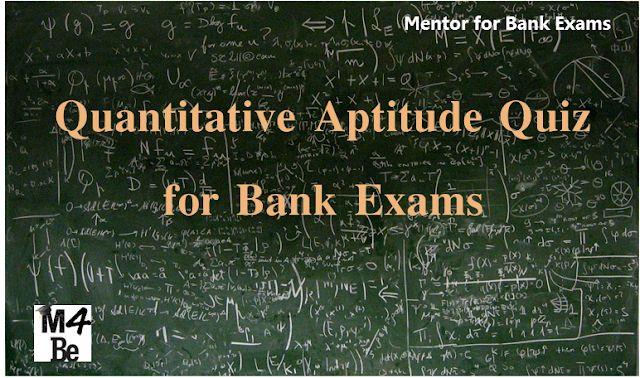 What approximate percentage of marks did Simpy score in the examination, if she got 67 marks more than Ankita? Quantity 2: The length of a rectangle is increased by 60%. By what percent would the width have to be decreased to maintain the same area? 5. 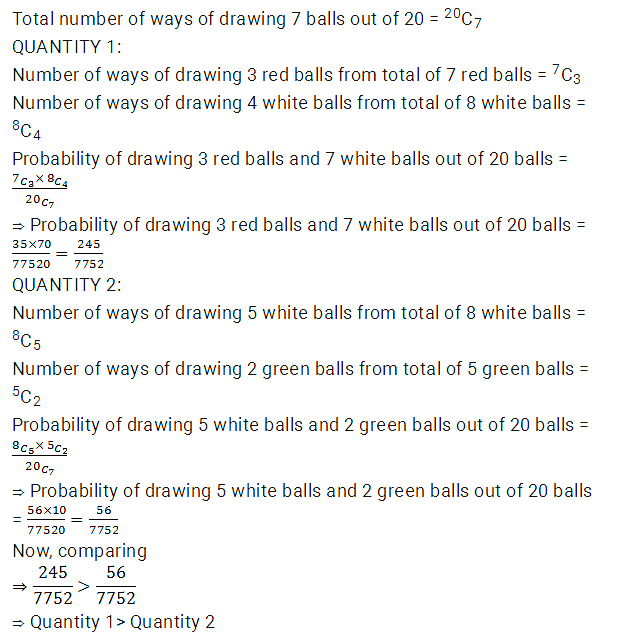 Quantity 1: Number of hours in which A, B and C can complete the work if A, B and C alone can finish it in 25, 20 and 15 hours respectively. 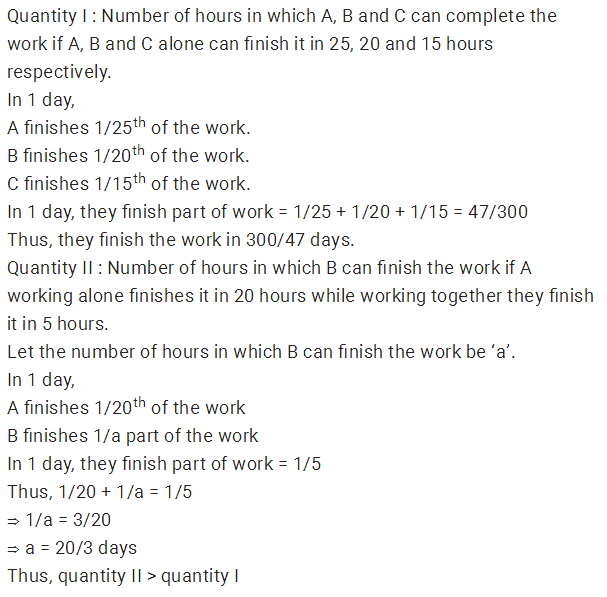 Quantity 2: Number of hours in which B can finish the work if A working alone finishes it in 20 hours while working together they finish it in 5 hours. 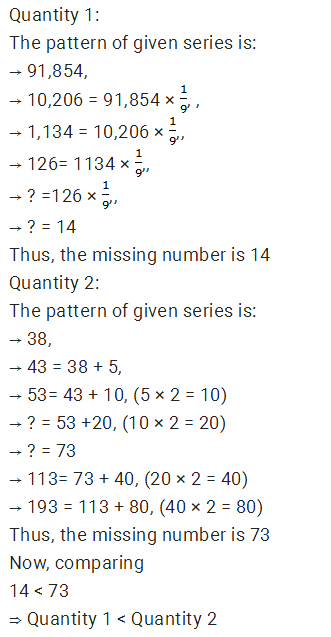 Directions (6 – 10): Study the following information carefully to answer the questions that follow. There are two trains Duronto and Talgo. Both trains have four different types of coaches i.e general coaches, sleeper coaches, first class coaches and AC coaches. In Duronto there are 800 passengers. Talgo has 40% more passengers than Duronto. 25% of the passengers of Duronto are in AC coaches. 15% of the total numbers of passengers of Duronto are in general coaches, 28% of the passengers of Duronto are in sleeper coaches and remaining passengers of Duronto are in first class coaches. 40% of the numbers of passengers of Talgo are in sleeper class coaches. Total number of passengers in AC coaches in both the train together is 390 and 15% of total passenger of Talgo are in first class coach. Remaining passengers of Talgo are in general class coach. 6. What is the ratio of the number of passengers in first class coaches of Duronto to the number of passengers in sleeper class coaches of Talgo? 7. What is the total number of passengers in the general coaches of Duronto and Talgo together? 8. What is the difference between the number of passengers in the AC coaches of Duronto and total number of passengers in sleeper class coaches and AC coaches together of Talgo? 9. Total number of passengers in First class coaches in both the trains together is approximately what percentage of total number of passengers in Talgo? 10. If cost of per ticket of AC coach of both the train is Rs.350, what total amount will be generated from AC coaches of both the train? Let length and breadth be 100.